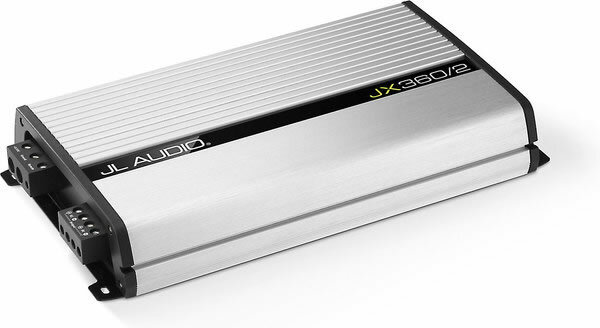 Click the button below to add the JL Audio JX360/2 to your wish list. When you see a moderately priced amplifier loaded with chrome and lights, you know that the money to pay for the bling came from somewhere, and that ‘somewhere’ is under the hood. By contrast, when you inspect a JL Audio JX amplifier, you will see that nothing is spent on gimmicks, blue lights or chrome. Instead, we apply our no-nonsense, pure performance philosophy to specify oversized output transistors and rugged MOSFET power supplies that ensure ample current and thermal capacity. These beefy parts operate well under their limits to deliver stable performance and vastly better reliability than the wimpy devices commonly found in many competing products. It all adds up to solid bass definition and cleaner, louder high frequency output that gets the most out of your speaker system. Dimensions (L x W x H): 12.80" x 7.68" x 2.15"
Mega-watt have been using JL Audio in our own cars for 15 years and have used JL Audio in most of our IASCA winning cars, we have huge experience and extensive knowledge on all JL Audio products. Call 07775 165 379 for expert advice.